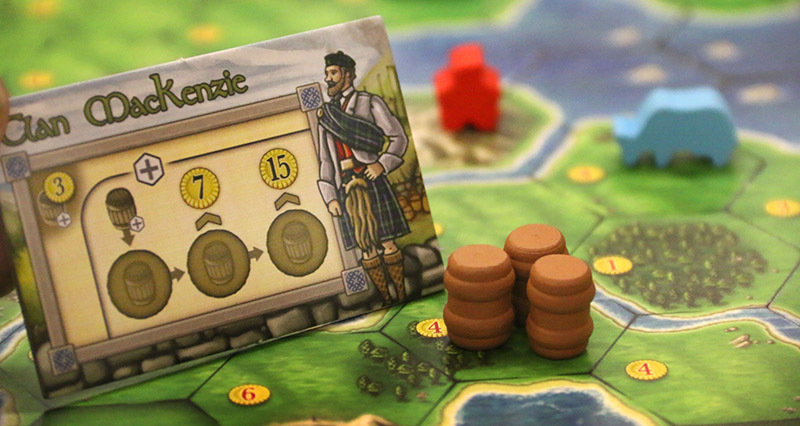 Clans of Caledonia is a mid-to-heavy economic game set in 19th-century Scotland. At this time, Scotland made the transition from an agricultural to an industrialized country that heavily relied on trade and export. In the following years, food production increased significantly to feed the population growth. Linen was increasingly substituted by the cheaper cotton and raising sheep was given high importance. More and more distilleries were founded and whisky became the premium alcoholic beverage in Europe. Players represent historic clans with unique abilities and compete to produce, trade and export agricultural goods and of course whisky! 1. Players take turns and do one of eight possible actions, from building, to upgrading, trading and exporting. When players run out of money, they pass and collect a passing bonus. 2. In the production phase, each player collects basic resources, refined goods and cash from their production units built on the game map. Each production unit built makes income visible on the player mat. Refined goods require the respective basic resource. 3. Players receive VPs depending on the scoring tile of the current round. 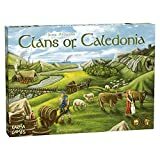 The game comes with eight different clans, a modular board with 16 configurations, eight port bonuses and eight round scoring tiles. 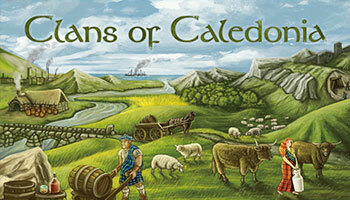 Clans of Caledonia is a strategic economic game set in 19th-century Scotland. During this period, Scotland made the transition from a predominantly agricultural economy to an industrialised one, heavily reliant on trade and export. As a consequence, food production increased to support the growth in population, cheap cotton imports increasingly replaced linen, and raising sheep gained importance. Several members of this clan were prosperous 'Tobacco Lords' in Glasgow. Most of their tobacco imports from the United States were immediately re-exported to mainland Europe. Buchanan Street is one of the main shopping streets in Glasgow and was named after a wealthy Tobacco Lord, Andrew Buchanan, who owned the land it was originally built on. Use this bonus in a turn when you fulfil an Export contract requiring Meat. The fulfilled Export contract requires 1 fewer slaughtered animals. Discard one Basic good of your choice and gain any three Basic goods of your choice (including the type you discarded). Discard one Processed good of your choice and gain any two Processed goods of your choice (including the type you discarded). Receive one Bonus upgrade and gain 3 Glory.